PLO Secretary General again threatens to cancel recognition of Israel if the United States moves its embassy to Jerusalem. 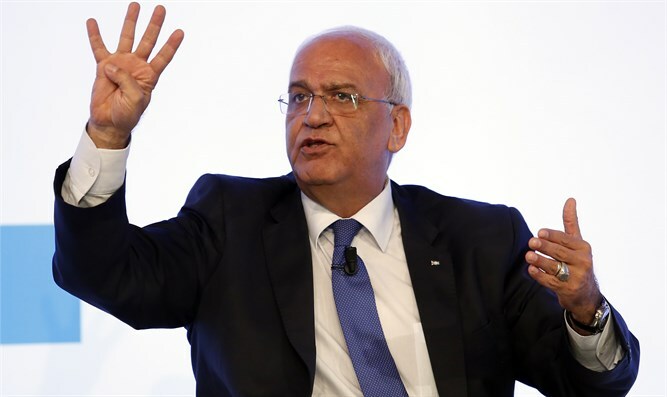 Palestine Liberation Organization (PLO) Secretary General Saeb Erekat on Tuesday threatened yet again that the PLO would immediately revoke its recognition of the state of Israel if the United States moved its embassy in the country to Jerusalem. "If the Americans or anybody else move the embassy, it is a fait accompli, a recognition of the annexation of East Jerusalem. Period," Erekat said during a visit to Paris, according to the AFP news agency. "For us Palestinians, it's meaningless to have a Palestinian state without East Jerusalem as a capital, he added. "If we wake up one morning, turn on Fox News or CNN and find that somebody signed the decision to move the embassy, the same day the PLO recognition of Israel will be revoked," threatened Erekat. Moving the American embassy from Tel Aviv to Jerusalem in recognition of Jerusalem being Israel’s capital was one of President Donald Trump’s central campaign promises. While Israel has welcomed the move, it has been met with anger among Palestinian Authority (PA) officials. PA chairman Mahmoud Abbas recently promised a “political and diplomatic response” if Trump moves the embassy to Jerusalem. He did not elaborate. Previously, Abbas wrote Trump a letter in which he warned him against moving the American embassy, saying that such a move would be crossing a "red line" and could jeopardize peace prospects. Tuesday’s warning is not the first time that Erekat has threatened that the PLO would revoke its recognition of Israel. The PLO, however, never did recognize Israel officially, despite promising to do so in the Oslo Accords. The PLO has never changed its charter which states that Israel has no right to exist. Erekat also said Tuesday that if the embassy were moved, the PA would "ask the Israeli occupation power to resume its responsibility." "They don't need to send us money because it's the responsibility of the occupying power to pay the salaries. Then we will go to the UN to tell them that this country is not abiding by resolutions, by any international law and we want to suspend its membership until it behaves," he said, according to AFP.